That’s so-o welsh, that is! • or… I could buy a few tinnies for the Aussie rugby boys, who out-Walesed Wales, by turning adversity – two men down – into some bloody, black-eyed, backs-to-the-wall Alamo/exemplar. • or go off on one about how even though I’m as fed up as you lot with hearing the word ‘execution’, Wales surely really did need to execute one of the forty-three chances to get points on the board whilst Genia and some other bloke were unemployed for ten minutes each. Because that would have been the difference and mostly there had been no difference in the levels at which the two sides were playing – unusually, for a contest between northern and southern hemispheres. I may do all three – or I would like to. Or one of many other things which reek of or speak of the cultish-crazy, leeky, drunken, stolid, donkey-derby wonderwallness of the day. Wonderwall because hope is somehow scorching dizzily through. Rightly and deservedly if not entirely predictably for Biggar and Roberts and Davies; amaaaazingly and deservedly for Ramsey and Hennessey and Bale. But donkey derby? Dare I be ‘avvin’ a pop at the lack of quality somewhere here? In (let’s say) that team of Coleman’s? How could I? Why would I? ‘Fraid I must. Though I’m the daydreamiest of believers in hwyl and teaminess, I do have guilty concerns about Wales’ football achievements; or rather about what happens next. On the one hand it’s clearly and unarguably marvellous that a side with only three international players – Ramsey/Bale/Williams – has shown such a durable mixture of organisation, work-rate and (crucially) togetherness that they’ve fair scooted through the qualification process. That Coleman fella – who many of us were labelling simply out of his depth in elite level togger – has engineered an inviolably significant and maybe particularly personal achievement here. But the thing is that despite remaining unbeaten against Belgium and that stand-out 3-0 away win in Israel, Wales have shown little quality other than those qualities that have seen them through. They’re gonna need more. Many hackles will rise at this point and I understand why, when – DOH! OBVIOUSLY – those qualities are all part of the spirited package that is sport. I get that. In fact I spend much of my working life and most of my scribbling time BIGGING UP the notion that soulbrother or sisterhood is both an essential and a hugely rewarding facet of these daft games of ours. And yet. And yet there must be skill; we should aspire to the beautiful and the profoundly pleasing as well as to brothers-in-arms resolution, a) because it’s philosophically right and b) because that’s how the success builds. So though I absolutely applaud what is an undoubted success for Coleman’s crew, I exercise my right as a fan to want more/advise for more. Please. For much of today’s game Bosnia struck me as a team playing close to the lowest acceptable standards for international football. Consequently, early in the second half, without ever looking fluent or (actually) entertaining, Wales were coasting. But they lacked the quality to pick off their poor opponents. Even with Bale on the park, Wales lacked a real threat, a focus, as they fluffed the opportunity to dismiss the Bosnians. (Incidentally, despite his goal-scoring record, I think Bale has been decidedly average, or certainly disappointingly inconsistent, too often in this campaign. Am I alone in that?) Robson-Kanu meanwhile, epitomises the Willing But Limited category that the bulk of the side (regrettably) fall into. Some of this sounds spiteful and/or simply illogical. Let me swiftly express again my suspiciously amorphous disquiet at the relative absence of refined talent in the group… and then we’ll move on. What I suspect we can all share and enjoy is the delicious Welshness of the moment of qualification; via a crap result against a crap side. And that not mattering. 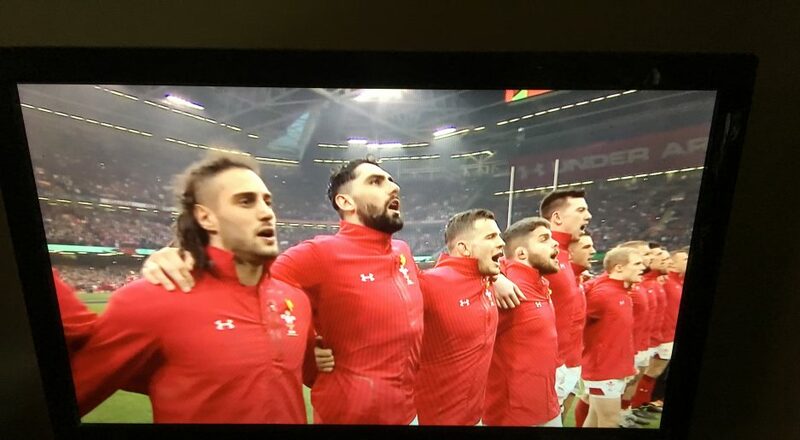 Plugged in as usual to the twittersphere, I loved that so much of the day’s #bantz seemed to belong to The Principality – and no, don’t be daft, I don’t mean the mob who’ve just bought the rights to the Millenium – I mean Wales. Before dropping back into events at Twickers, mind, we should really be noting the further hike in #RWC2015’s dander during and following the boshtastic Scotland Samoa game. The evident passion, commitment and commitment to drama in this encounter re-lit the tournament for the umpteenth time and was again a proper fillip for rugby globally. This was a match where onslaught followed onslaught and the world again shared Samoan grief as though it was our own. The pride and the bonkers levels of what we may have to call bonding or devotion were sensational… and the boy Laidlaw dun well again. • timelines full of jokes about how appropriately (i.e. welshly) Gatland’s and Coleman’s teams achieved their notable successes; firstly by both getting roundly defeated and secondly by acquiescing in the universal conspiracy to give them what they deserved, anyway. • And I note the kind of start – in fact the kind of first half from Wales rugby – that said something rather profound about being comfortable in the challenge. Perhaps this then was the Welsh Haka? An expression of confidence… and a welcoming for the trial? It did feel like a validation – like Wales were being clear that they knew they were worthy – and ready. And that may yet project forward (who knows?) to powerful advantage. However, turns out Wales rugby too wasn’t quite skilled enough to execute/penetrate/skewer the enemy. When those endless yellow moments came the Roberts-centricity of the Gatland era was maybe exposed? Phase after phase was rebuffed by the inspired bison in gold ‘n green. Whether this was an opportunity criminally and terminally missed (I suspect it was), or whether this Hen wlad will resurrect yet again in all its perversely gog or cardi or starless and bibleblack glory, who can tell? But in defeat, in squeaky-arsed glory, the day belonged to Wales. < Previous It couldn’t just be sport. Next > #RugbyWorldCup2015; questions arising.